Lily of the Valley is a popular plant due to its delicate blooms. Lush green leaves surround the long stems of tiny white blossoms. The white blooms have a bell like shape and point toward the ground. 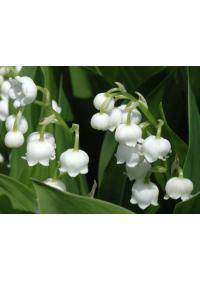 For bouquets and other floral arrangements, Lilies of the Valley can be special ordered around the Olathe, KS, Sparks, NV, St. Petersburg, FL, Milwaukee, WI, and Westminster, CO areas, as well as some others that are not listed. Be sure to call in advance to ensure availability. The fragrance is immensely popular with many bath and beauty products. It is used in perfume as well as many lotions and home fragrances. It can also be used in a bouquet to create a fragrant assortment. Convallaria Majalis grows mostly in woodland areas where it is cool. Some gardeners consider it to be the only species in the genus. Others acknowledge the other two commonly linked species in the genus. C. Majalis is a perennial that is found in shade and partial shade. It often prefers moist areas such as woodlands and near marshes. This is the most commonly found type of Lily of the Valley around. It blooms in the early spring and produces tiny sweet smelling blooms. The characteristic smell makes it easy to recognize in the wild. It can also spread quickly in areas where it is left undisturbed. C. transcaucasica appears more compact than the other lily species. The bells are more pear shaped and can appear as a very pale pink. In the wild it can often be found growing near cyclamen plants. C. keiskei is noted for being very similar to the other species. It attracts a large number of butterflies and bees every spring. It can also readily self pollinate, allowing it to rapidly spread. Full shade is often the preference of this delicate blooming flower. It is often planted under a tree to create a soft ground cover. It may also be planted along the edges of woodsy areas for cover. Partial shade may also be used if there are no shady spots available. Others may choose to use full or partial sun spots in the garden. Some of the varieties may not perform as well in full sun locations. When planted in a garden it is important to not over crowd plants. It will readily spread, so extra space should be taken into account. They may need to be thinned out if they begin to spread too thickly. Almost any soil type can be used, allowing for more planting options. Loamy or light soil mixtures may sometimes get the best results. Some may prefer to add compost in order to provide enough nutrients. The most common meaning for this flower is the return of happiness. This is because it appears early in the spring after winter fades. This makes it a touching addition to any bouquet for a partner. It is also used to symbolize completeness in a life or a marriage. It can be given in a bouquet on an anniversary or for a honeymoon. It may also given for a birthday to show a spouse they are loved. The white color also can be used to symbolize purity and chastity. This makes it a popular choice for those sending bouquets to friends. It may also be used to help symbolize a sincere apology to someone. The blooms are often found in bridal bouquets and spring mixes. As the blooms are delicate extra care must be taken to preserve them. Florists often add Lily of the Valley to many spring bouquets.